Frame drums are a group of drums which have a diameter greater than their depth. Frame drums can range greatly in size (from ~4 inches in diameter and ~1 inch deep to ~30+ inches in diameter and ~6+ inches deep and anything in between) and can be played with hands, fingers, sticks, or a combination of the above. Most drums can be categorized by their shape. 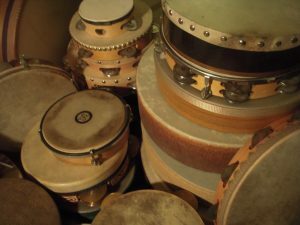 For frame drums, there’s just a round hoop or frame for the head (or heads) to attach to and to hold onto it while playing, there’s not a big resonant body. 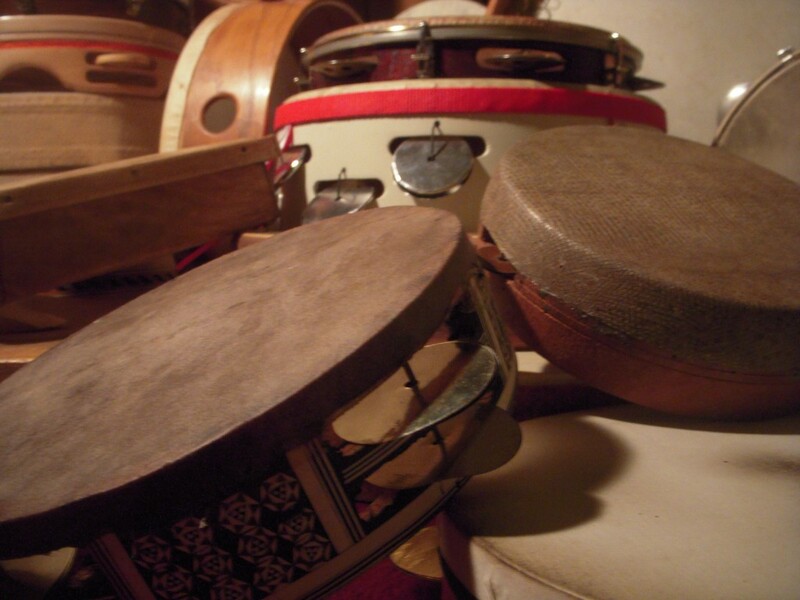 Examples of some frame drums are bodhrans (Irish), tars (North African), and tambourines (all over the world). Examples of goblet shaped drums are djembes (West African), dumbeks (Egyptian), and Tombeks (Iranian). Examples of conical shaped drums are ashikos (Nigerian) and atabaques (Brazilian). Examples of hour-glassed shaped drums are the family of batas (Cuban) and the dundun (Ghanese). Frame drums are some of the oldest, most common instruments. There are traditional frame drums found in almost every remote region and culture of the Earth. They are said to have originated from common grain sieves. Workers sifting grain and singing songs to pass the time while batting the mess on the bottom of the sieve rhythmically to the voices to knock the stuck debris out, hence adding to the rhythmic pulse and forward momentum of the music and of the workday. Once the mesh was worn out and unusable, you could stretch an animal hide across it and devote it to the after supper music jam. The tambourine is a form of frame drum with zils (jingles or little cymbals). Some frame drums have rings attached like the Ghaval, Daff, and Doyra; some have gut wires (similar to snares attached) like the bendir. The Irish bodhran is one of the most common frame drums people in the West come across. It is played with a tipper (short stick) in one hand and usually has a crossbar connecting the frame behind the main playing side of the drum head for the other hand. The following frame drums are one that David teaches at the professional level: the Lap-Style or “on the knee” frame drum (in the lineage of Glen Velez), the Tar (North Africa), the Bendir (Morocco), and the Riqq (Lebanon). 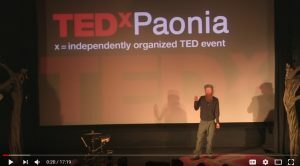 David also teaches the following frame drums at a beg inning to intermediate level: Pandeiro (Brazil), Kanjira (southern India), Bodhran (Ireland), Ghaval (Persia), Doyra (Uzbekistan), Daff (Persia), Tamburello (Italy), and Classical Tambourine (Europe). More information on David’s percussion teaching. Download a frame drum groove sheet: Beginning grooves for frame drums and goblet drums. Good inspirational frame drummers to check out….Glen Velez, Layne Redman, David Kuckherman, Zohar Fresco, and Abbos Kosimov. Layne Redmond wrote a book on the history of the frame drum called, “When the Drummers were Women”. David’s frame drum teachers include: Jon Seligman (lap-style framedrum /riq /kanjira /tar), Glen Velez (lap-style framedrum /tar), Layne Redmond (lap-style framedrum /tar /riq /pandeiro), David Kuchermann (lap-style framedrum /riq /tar), Bruno Spagna (Italian tamburello), Abbos Kosimov (Uzbekistani doyra), Clarice Castilho (Brazilian pandeiro), N. Scott Robinson (lap-style framedrum /ghaval /kanjira /pandeiro /riq /tar), Faisal Zedan (Egyptian riq), Miranda Rondeau (lap-style framedrum /tar), Brad Dutz (pandeiro), Randy Gloss (South Indian kanjira), Thomas Zirkle (riq), Naghmeh Farahmand and Pejaman Hadidi (Persian daff /Iranian tombek techniques applied to framedrums), and John Bell, Marla Leigh, and Andy Skellenger, (tabla techniques applied to framedrums).